According to Marca and other sources in Spain, Kaka will be presented at the Bernabeu next week, having completed a â‚¬65m deal to Real Madrid. 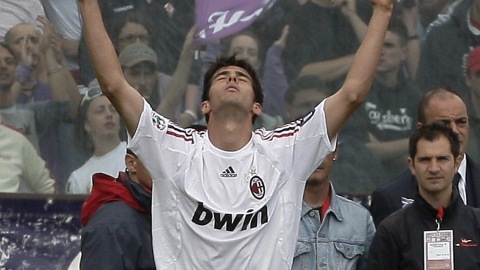 Although Kaka said he didn’t want to leave Milan, I never doubted that this deal would happen. Real had to act in the face of Barcelona’s treble and they always react by spending ridonkulous amounts of money. Marca says there are still some “loose ends” to ties up regarding Kaka’s contract, but it seems the deal is all but done. The Brazilian will be paid a reported â‚¬9m per year for five years and retain half his image rights. That deal has also been confirmed by Milan president Silvio Berlusconi, who told news agency Ansa that Madrid were offering more money than the Italians could hope to match. “They have offered him so much money. You can’t keep someone against his will,” Berlusconi said. Sky is also reporting the story, which is more than a rumour, but not quite true (yet). This is another triumph for La Liga, and another sign that Serie A is in serious trouble financially, at least when compared with the Spanish and English Premier Leagues. I admire Kaka for not taking Man City’s cash, and though I’m sure the money had a lot to do with his move to Madrid (on Milan’s part as much as the player’s), I suspect Kaka will be happy to go to Madrid rather than Manchester. Hell yes! Loads of sources reporting it now. Very small chance it could be a false alarm, but I doubt it. Agreed. Not yet confirmed, but all the signs point to a move to Madrid. I’ll say Ribery will go to Chelsea or Manchester United. Madrid will have to have a summer sale to be successful and maybe pick up David Villa in case Ruud or Madrid’s one man goal scoring machine Gonzalo (let’s face it, he basically carried the team this term) pick up a knock and can rotate. A lot of people must go. Faubert, Huntleear or V.D.Vaart, and so on. For a club of that caliber, Madrid were so rag tag last season. So Ronaldo is not going anywhere now?